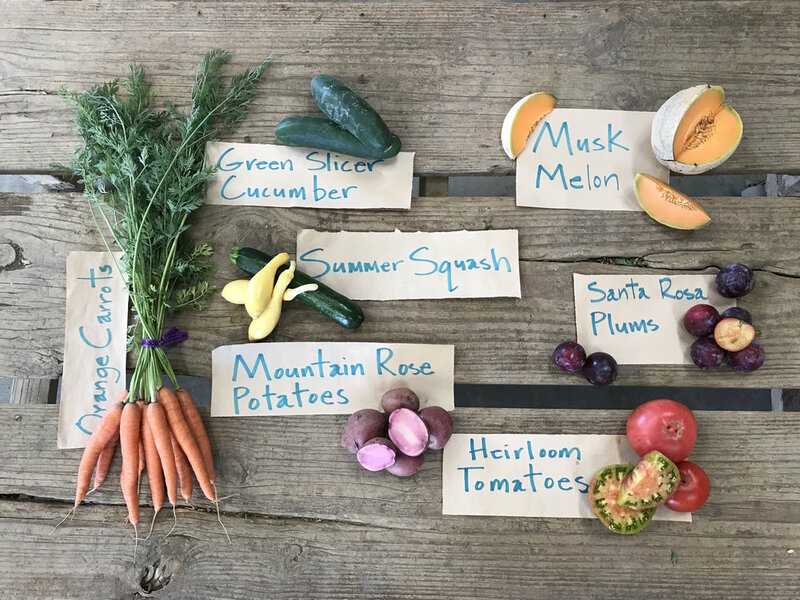 Box Notes: June is a lean month on the farm as we are waiting for our labor (field prep, seeding, transplanting, weeding and laying drip line for irrigation) of the past 6 months to bear fruit. This is the time of year when we focus on trellising the 23 acres of tomatoes to train them to grow vertically for easier harvest and more uniform ripening; direct seeding of winter squash; and greenhouse seeding of the fall crops (kale, chard, fennel, and cabbage) to be transplanted in early August. Leeks will arrive from Headstart Nursery in Gilroy that we will transplant next week. The planting cycle is perpetual here at the farm. Thank you for your continued support of the farm with your weekly purchase of the veggie boxes, eggs, and pastured pork/chicken! Field Notes: Whoa, the rain continued, literally out of the blue, on Sunday with a very dramatic downpour in the afternoon and a big show of lightning and thunder. We received about .4 inches during the June storm, enough to settle the dust and keep the plants moist for a few days before temperatures spike later this week. We harvested the first Gold Nugget cherry tomatoes last week and are excited to feature them in the veggie boxes by early July. Also new for the farm are tomatillos and Shoshito peppers. As soon as we have these in quantity, we will offer them in the summer veggie boxes. Pork Shares are available. The pork shares are a combination of smoked and cured pastured pork sausage and bacon along with cuts such as ribs, chops, and roasts. During the summer months, we also offer a BBQ pork share that includes lots of ribs (country, spare, or baby back) and pork cuts for grilling. The pork shares are $8 per pound and range in total weights of 10 to 19 lbs. Please email the farm: csa@riverdogfarm.com to place an order! Save the Date: Saturday October 7 and 8, 2017 Hoes Down Harvest Festival at Full Belly Farm in Guinda. Visit: hoesdown.org for ticket information and volunteer opportunities.